Armata vs. Abrams: Who Would Win If Russia and America's Best Tanks Battled? During the Cold War, the United States and the Soviet Union engaged in a constant competition to develop better tanks and anti-tank technology. While this was disrupted by the breakup of the Soviet Union and the resulting cuts in defense budgets on both sides, the next generation of tanks are finally reaching maturity. Representing the United States and based on a slow progression of technology on an existing design is the M1A2 SEP v3. Representing Russia and based on a set of almost all-new technology and design is the T-14 Armata. While truly accurate comparisons of these tanks is almost impossible due to the classified nature of their exact characteristics, it is possible to analyze their capabilities based on a comparison of what we know of their systems and subsystems, to get a rough idea of how they might perform on the battlefield. The T-14 Armata can be accurately described as the first true “Russian” tank to land a contract for production, as it is the first tank design to do so that came after the fall of the Soviet Union. Design work for it began in 2010  at OAO NPK Uralvagonzavod (UVZ), which also designed the T-55, T-62, T-72 and T-90 tanks. The tank is designed around the unmanned turret, which makes it unlike any other main battle tank (MBT) in service and gives it a unique set of advantages and disadvantages. It also includes next generation versions of systems that were considered key systems of previous generations of tanks: 125mm smoothbore cannons, Explosive Reactive Armor (ERA) and Active Protection Systems (APS). The almost complete use of domestic products is also notable. Russian tanks used to rely on high-tech foreign components in some subsystems. The entire information management suite—hardware and software—is also domestically produced. Recommended:The Story of the F-52 Fighter. Recommended:The 5 Biggest Nuclear Bomb Tests (From All 6 Nuclear Powers). Recommended:How Israel Takes U.S. Weapons and Makes Them Better. 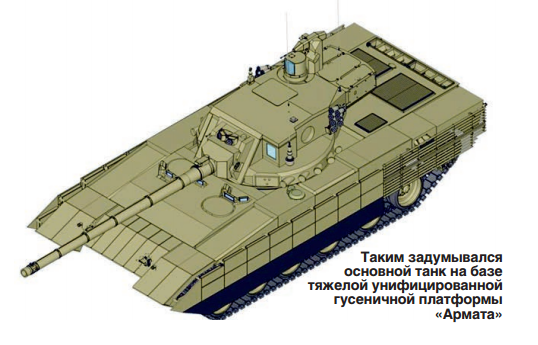 The unmanned turret provides the Armata with its main advantage: enhanced crew survivability. While maximizing crew survivability is always a priority in tank design, the Armata takes it to the next level by placing the entire crew in an armored capsule in the tank’s hull. This allows for better crew armor protection as the armor can be concentrated to protect this capsule in the hull—as opposed to being spread out to protect crew positions in the hull and the turret. The ammo is separated from the crew, increasing the probability of crew survival in the event that the ammunition load is hit. In prior Russian tanks, the ammunition was stored in the same area as the crew, surrounding them. 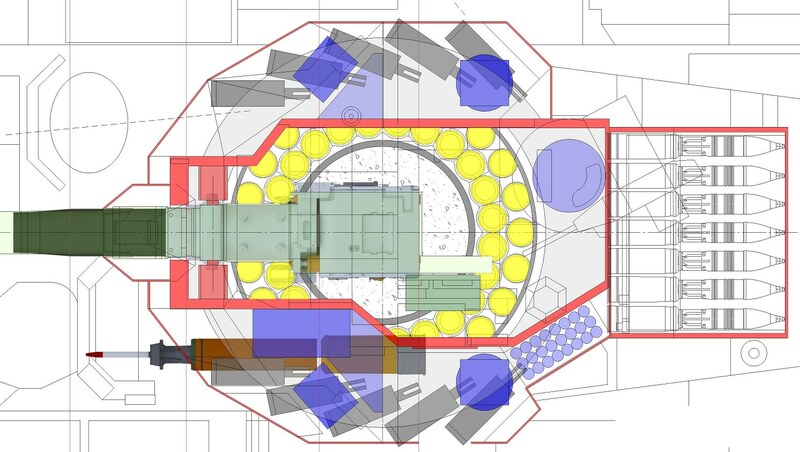 The separate ammunition and crew capsules could allow for more aggressive firefighting methods—such as flooding the entire chamber with CO2 gas, which would kill the crew of a manned turret—but it is unknown if these systems are implemented at this time. This design is not without its drawbacks. Unlike some Russian tanks that have dual gunners’ sighting systems, such as the T-72B3, the Armata only has one gunner sight on the turret that is fed remotely to the gunner’s station in the fighting compartment. While the commander’s sight might provide some level of redundancy—assuming it is fully linked to the fire control system—disabling these two sights, or their linkages, to the fighting compartment would severely cripple Armata’s ability to fight and the situational awareness of the crew. The turret is not well armored and current estimates suggest that it would be vulnerable to anything larger than a medium calibre autocannon. Under the angular “cover,” which is usually assumed to be sheet metal with resistance to not much more than small arms, the turret’s shape is a block of steel armor. The thickness of this armor, which surrounds the breech and loading mechanism of the gun, is unknown but in speculative mockups  it does not seem to be very thick. The sights and APS are generally accepted to be outside of this armor, meaning that they could be damaged through the cover from shots from a side aspect of the tank. The other improvements of the Armata are fairly standard. The new 125mm 2A82 gun is paired with new “Vacuum” APFSDS rounds in both Tungsten and depleted uranium variants, which should provide improved anti-tank performance. The primary difference in the new cannon is the increased operating pressure to allow for a higher muzzle velocity, although these exact parameters are unknown. The 2A82 gun also lacks a bore evacuator, a device that reduces the burnt propellant gases entering the breech compartment after firing, as it is unnecessary for an unmanned turret. It also can shoot the “Telnik” programmable high-explosive round and the new “Sprinter” gun-launched missile. The Malachit ERA, which is present on the hull and on the top of the turret is said to be more effective than earlier generations. In addition, the tank fields the Afghanit APS, which includes hard-kill components. This is the second time a APS with hard-kill has seen contract adoption on a Russian tank, with only the Drozd system being deployed before on the T-55. This is said to be effective against all threat types, whereas Drozd could only defeat ATGMs and HEAT projectiles within a certain velocity range. Afghanit also covers a wider frontal arc than Drozd. The M1A2 SEP v3 also incorporates improvements  in key areas. Many of these changes relate to logistics and battlefield networking, improving tank readiness and battlefield awareness. In addition to these, there are specific items that improve the M1A2’s tank vs tank performance directly. A new Ammunition Datalink (ADL) module allows the M1A2 to shoot the new M829A4 advanced APFSDS round, as well as new types of multipurpose ammunition from the same M256 120mm cannon. There also is an improved armor package, but details are unknown. Other sources state that the thermal imaging gunner’s and commander’s sight will be upgraded to third-generation imagers, improving resolution and clarity at range. In 2017, it was also announced that the M1A2 SEP v3 package would include the Trophy Hard-Kill APS , improving its protection. In the end, the M1A2 SEP v3 is an incremental improvement and would likely fight the same way previous M1s have, just better. Unlike the T-14, it doesn’t radically change the way the vehicle can fight. In a fight against each other, the M1A2 SEP v3 would likely have an advantage in detection. All thermal imaging matrices in the United States are produced indigenously and have been for generations. Meanwhile, the Russian thermal sights on the Armata are thefirst batch that will be produced in Russia, so they likely will be inferior to American sights. The turbine engine of the Abrams is also likely quieter than the diesel of the T-14 Armata, but the Armata is lighter and has a better horsepower to ton ratio, giving it better mobility. Trophy doesn’t appear to provide this capability, in a 2016 meeting with the Congressional Research Service, discussing the use of APS on American combat vehicles, Rafale said Trophy  “provides protection against all known chemical energy threats, including chemical energy tank rounds.” Nothing was mentioned about APFSDS rounds. Chemical energy tank rounds (commonly known as HEAT rounds) travel more slowly and are easier to intercept than APFSDS rounds. Thus, the Armata is probably significantly more survivable than the M1A2 SEP v3 and could potentially defeat American rounds before they even hit the armor. Whether it’s actually possible for an APS to intercept the hypersonic APFSDS rounds has yet to be seen. Despite its superior APS, the thin armor on the Armata’s turret could be its undoing. An autocannon could potentially knock out the sights of the Armata by shooting through lightly armored cover. The earlier mockups suggest such a shot could be taken from a rather wide arc, as opposed to on other Western tanks where the sight is more smoothly integrated into the hull. The gunner’s sight being outside of the main armor on the Armata makes it a larger target than the gunner’s sight on the M1A2 SEP v3. The commander’s sights on both tanks are about equally exposed. If a modern M829A4 round got through the APS of the Armata and struck the turret, it would likely knock out the gun mechanism and take the Armata out of the fight, although the crew would probably survive. To conclude, the new design of the Armata makes its full crew far more likely to survive an engagement than the M1A2 SEP v3. It also makes it more vulnerable to a mission kill, even from lighter vehicles. The M1A2 SEP v3 is likely to spot and shoot the Armata first, although the Afghanit APS might negate this first shot advantage and provide the Armata crew a vector in which they could return fire. In the end, both the M1A2 SEP v3 and the T-14 Armata will likely see changes to their technical characteristics, capabilities, and systems before they enter service, as they are both still in heavy development.